Well, here we are again on our annual pilgrim through this most solemn week of the Christian calendar, which we call Holy Week or Passiontide. This week celebrates the love, the passion that Jesus possesses that leads Him to death on the cross for the benefit of all. We should be reminded that love for Jesus was not an end in itself, He did not love for love sake but for the growth of others. He said it best in John 15: 13 – “Greater love has no one than this, than be willing to lay down one’s life for another”. It is this passion that in the course of the week through the liturgical moments of Maundy Thursday onto Good Friday onto Easter Day (the Easter Triduum) that we as Anglicans will be dramatizing with the prayer that it gives us a first-hand understanding of what our Book of Common Prayer has been moulding and shaping us to become, persons and a community that practices SERVICE IN LOVE TO BUILD COMMUNITY IN CHRIST. As the liturgical movement through the Easter Triduum will remind us, this will not be a painless exercise. It will test our resolve as the LENTEN Blessings (BCP 150) says – to grow in holiness, to deny ourselves, take up our cross and follow Christ. It will hopefully reveal some difficult, hard truths about ourselves and our community, but, we pray that we will be the better for this final act of repentance as we renew our Baptismal promises on Easter Day. 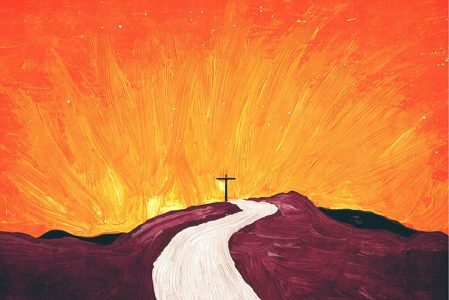 Thanks be to God through Jesus Christ the liturgical movement will pray with and for us that we may experience the following (BCP 150) – “Christ crucified draw you to Himself, to find in Him a sure ground for faith, a firm support for hope and the assurance of sins forgiven”. Take a look at the Lenten Season Blessing on page 180 – what in your life do you see that you need to die to, (e.g. – quick temper, judgemental attitude) and what qualities/virtues do you think that you need to pursue? Now, think about a community to which you belong. Do the same activity for that level. Now commit yourself to the task at both levels. How do these tasks ‘fit in’ with your Baptismal promises?